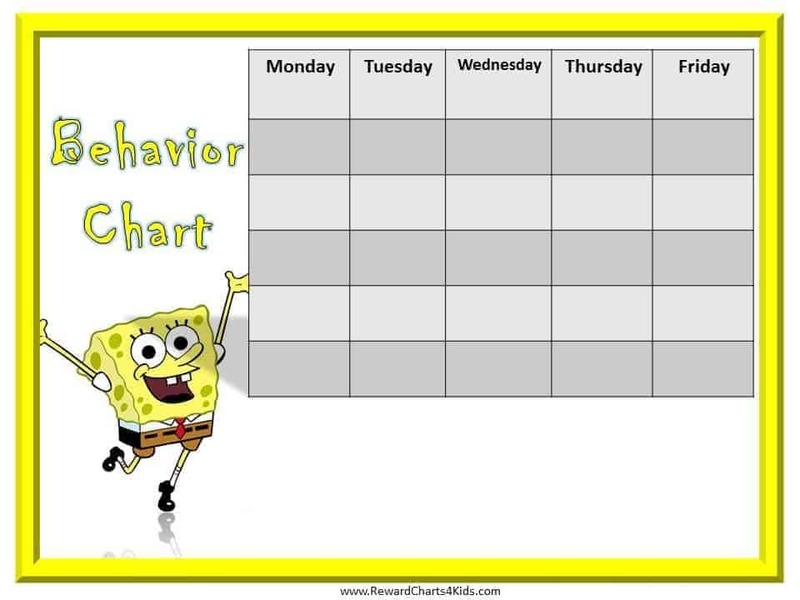 Free printable behavior charts with a SpongeBob theme. This SpongeBob positive reinforcement behavior chart can be printed for free and used to reward positive behavior. Print the behavior chart and place it somewhere where it will be easily noticed. Each time your child shows positive progress or behaves well mark the chart. Offer a reward when the behavior chart is completed. This sticker chart is in PDF format. To download it you will need Adobe Reader which can be downloaded free here. How do you use these behavior charts to improve behavior? Firstly, decide what behavior problems you want to tackle. If you have a few problems focus on one big one or two or three smaller ones. The older the child the more problems you can focus on at once. You can write the goals on the chart to remind your child what kind of behavior will entitle him to get a sticker on his chart. Try to phrase the goals in a positive manner. For example, I used words to express my anger. Secondly, decide what kind of incentives your child needs for motivation. Some kids are happy to get a sticker on their chart and praise. Other kids want a tangible reward once they complete the chart.